My vci 100 (regular) fell off my table and the usb port connector pins were damaged. I purchased a replacement part Here and unsoldered and soldered the new one in and I am not getting any power to the device. I wanted to know- was this port the correct purchase? What specs should ilook for in a usb port? I could take photos if those would help. I just looked up some more info in another thread, and it seems that this port may not be USB 2.0, in stead should I perhaps purchase http://www.tycoelectronics.com/catalog/pn/en/292304-1 this? Last edited by janco; 09-22-2010 at 11:15 AM. 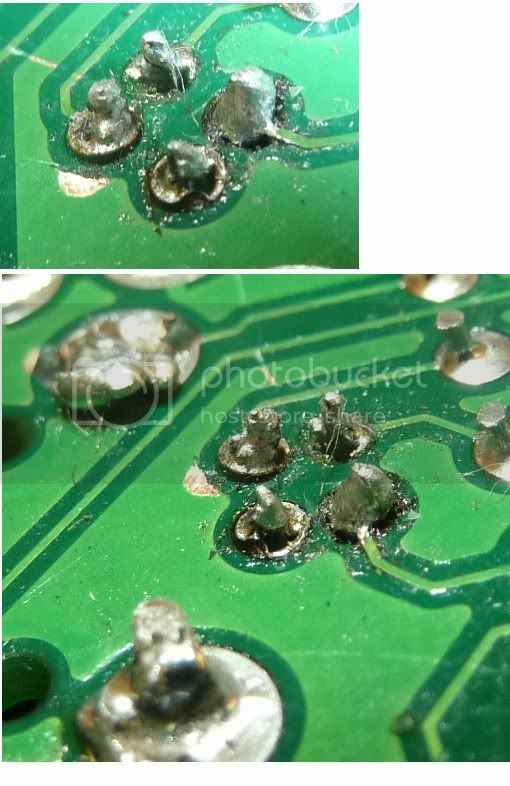 That connector is fine, I suspect you need to carefully check your soldering, and check for damaged tracking around the connector. The type B connectors can be tricky to remove cleanly so you may have damaged the PCB while removing it, or maybe it sustained that when it dropped of the table. I do know the pcb isn't damaged, as the port worked for a little while and it wasn't the solder that sustained damage but the cable that was plugged in snapped the plastic on the inside of the port, thus when i unplugged and replugged the connector wires didnt align and there was no longer function. But I took some photos of the soldering job, it is quite ghetto as I had to melt/drill out the old solder with a fine jewelry drill and try and resolder. My solder iron was very hot and seemed to burn the connection spot, is there anything I can do to try and make the connection better? Unfortunately I am limited in electronics ability, and my friends dad is a jeweler so he has the tools but not the knowledge. Ok carefully check the two pins on the top left of your first picture they are the power pins. you could try soldering a short length of wire from each pin to the next pin on the board (following the track). If this fails you probably want to find someone with some electronics experiance as unfortunatley this was caused by your removal method of old connector. I have a similar problem with my VCI. Needed to replace the usb pcb socket and have bought a usb 2.0 from maplin. The sockert has now been replaced and all soldering looks good but the unit is not powering up. There is power going to the switch but i am wondering if i have put the wrong socket on then could the power be sent to the wrong side? I guess what i'm asking is does this need to be a usb 1.1 port or has something else failed on the pcb. Here is a link to the socket i have added. @D-Kem that connector looks fine - check your soldering carefully, and also check that no other damage occurred. Soldering looks solid. No damage occured prior to socket change, simply the plastic breaking when removing a USB cable. Left with the conclusion that the PCB has been damaged during removal of socket. So what now? Can i get a new board from vestax or is there a way to salvage my treasured arcade controller? I'm by no means an electronic expert but muddle my way through generally.